A lot can happen in three games. 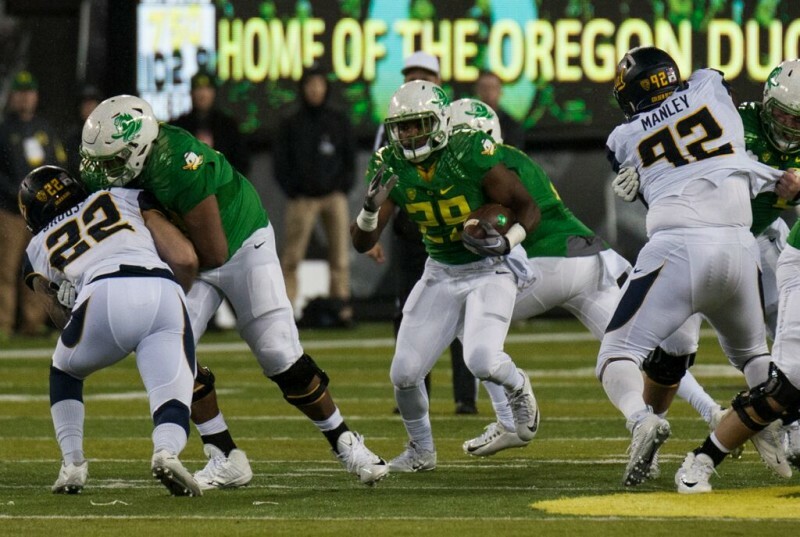 Three games ago, Oregon’s season appeared on the brink of disaster. 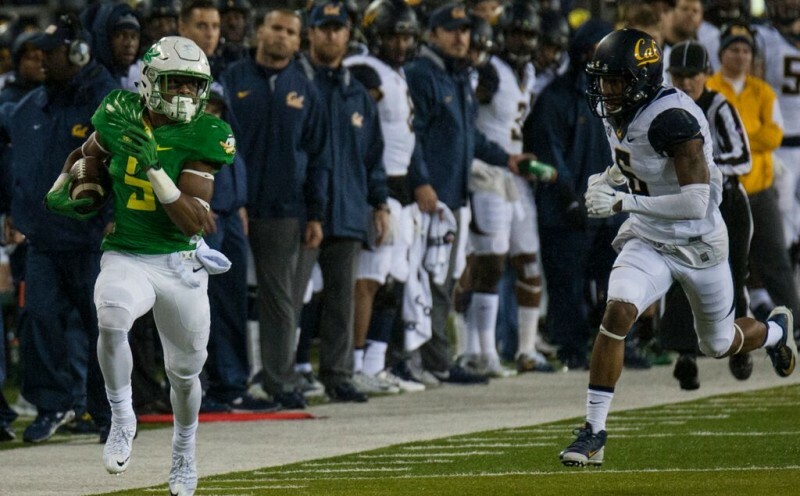 The Ducks were perched at 3-3, and had just lost at home to Washington State, making FCS Portland State the only team from the state of Oregon to beat the Cougars this year. If Oregon couldn’t beat Washington State, who could they beat? Were there even three more wins left on the schedule? Meanwhile, in California, the Golden Bears of UC Berkeley were doing fine. They had just lost a close one to then-top-5 Utah, but a road loss and poor quarterback play, against a top-5 team, is as explainable a loss as there is. Cal still controlled their North division destiny, and was only one win away from being bowl eligible. Kani Benoit with one of his eight carries for 94 yards against Cal. But that was three games ago. The Pac-12 is a much different world now. Washington State has been revealed far more formidable an opponent than first they showed, having played the Stanford Cardinal to the brink. Utah has been exposed, forced to justify their once-lofty ranking. Oregon surges in the North, and Cal, after an almost guaranteed bowl game after a 5-0 start, needs a win against Oregon State next week to keep those hopes alive. What once appeared as a matchup between the most able challengers to this season’s presumed North Division champion Stanford, became a tale of traded places. Oregon is undefeated since Vernon Adams’ return, while the Bears now own a four-game losing streak. Vernon Adams had 300 yards and four touchdowns against Cal. Seeing how the Ducks have battled over the past three weeks makes me wonder how this season could have gone if not for the old, familiar foe: The injury bug. Yes, the loss to Washington State cost Oregon its chance to control its own fate, and given its early season struggles, it would be easy to write off this season as unsuccessful — for not meeting the achievements of previous Ducks teams. But if Oregon can keep the surge alive, they will have done something few other teams in school history have done: Finish strong in November. Of their 26 regular season losses from 2006-2014, 18 of them came in the month of November. Only two were ever undefeated in November, the 2010 and 2014 teams, and they both played for the National Championship. The 2008 Oregon Ducks had plenty of thrilling finishes. That 2008 team faced similar challenges to this 2015 team — trying to replace a Heisman caliber quarterback with a variety of options — and playing uneven football until their best option at quarterback, Jeremiah Masoli, got healthy and found his groove. 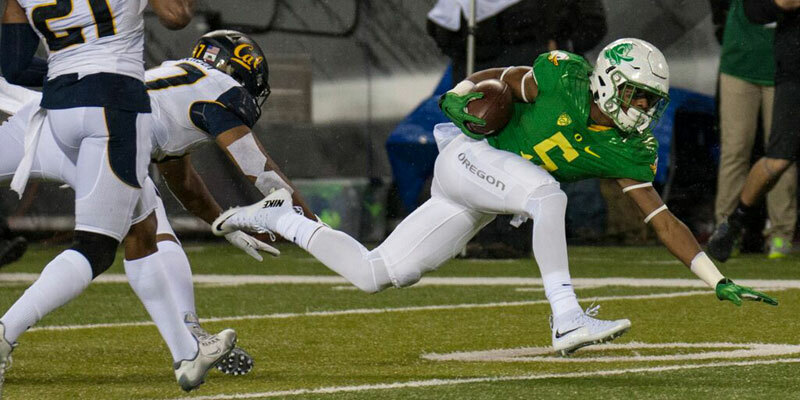 That 2008 team did lose in November, in a rainy, sloppy game against Cal — because by rule, Oregon-Cal games can only be played in monsoons — but they didn’t lose again, winning their final four games. That was the last Oregon team to lose three regular season games until this year, and after starting, you guessed it, 6-3, played spoiler for teams late. They kept Oregon State from the Rose Bowl (65-38), and kept Stanford from bowl eligibility. 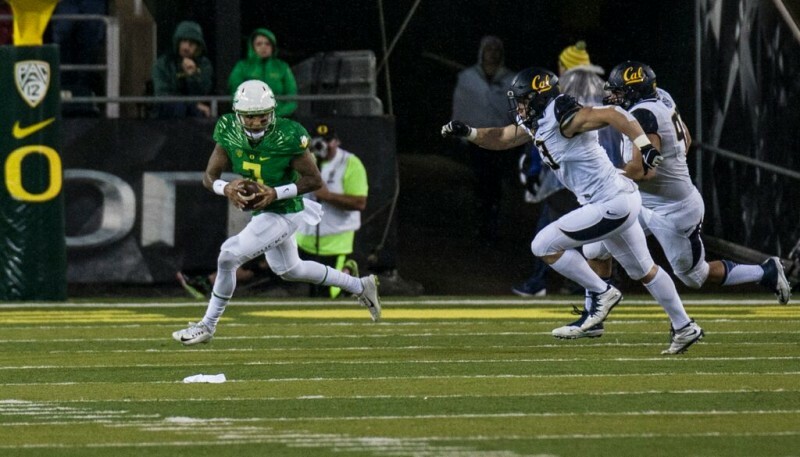 Taj Griffin had 59 of Oregon’s school record 777 yards against Cal. Achieving a perfect November won’t be easy. As a matter of fact, far from it. The Ducks next play Stanford on the road and USC at home — both will present a significant challenge. But the Ducks can pull it off. With USC in the hunt for a division title and Stanford aiming for the playoff, Oregon victories would emerge as great karmic justice, by spoiling the same hopes for the teams, that they themselves spoiled for Oregon twice — in back-to-back years, 2011 and 2012. This could be just the type of outcome that will define a successful season. Playing spoiler and exacting revenge would be a dramatic turn for a season once felt lost. It can all change with a perfect November; which will separate a memorable season from an ordinary one. This Saturday against Stanford, we will find out just the kind of season 2015 will be for the Oregon Ducks.